Oriental lilies: Summer's most stylish blooms? 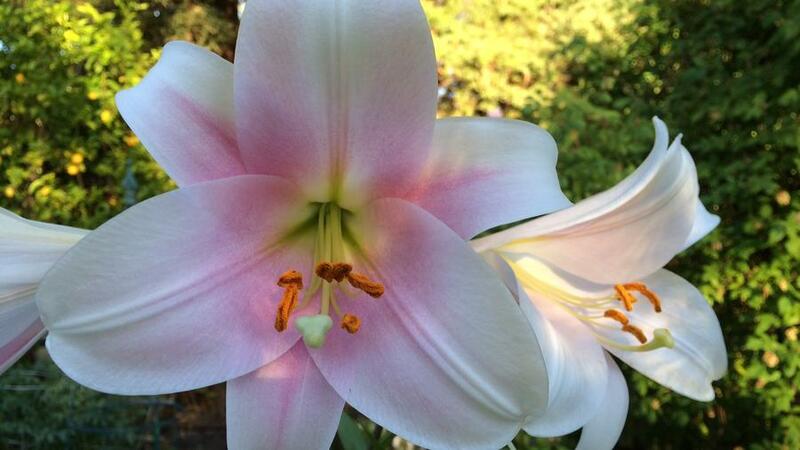 Oriental lilies: Summer’s most stylish blooms? We think so. Okay, I confess to a weakness for Oriental lilies. They’re exotic looking, richly fragrant, and as flamboyant as Katie Perry’s dresses. But the best thing about them? They’re blooming now in my garden, where everything else is looking, well, tired of drought. I have northwest lily grower Dianna Gibson to thank for that! Most markets and florists sell lilies in white and shades of pink or purple. But grow your own and you can choose from many shapes, colors, and patterns. I bought bulbs of these beauties at the San Francisco Flower and Garden Show. The pale yellow blooms with pink-star centers didn’t disappoint; they look just like the pictures on the package promised. The bulbs are drought tolerant (they’re cloaked with overlapping, leaf-like scales where they store water), so they don’t need irrigation until the soil is dry 1 to 2 inches deep. Just set the bulb in fast draining soil (in wire baskets, if you have gophers), 2 1/2 to 3 times as deep as the bulbs are tall. Stake tall varieties (to 5 feet) at planting time with short wooden stakes (you can replace them with taller ones as the plant grows). Dwarf varieties (2 to 3 feet tall) don’t need staking, and thrive in containers. Good companions include lavender, roses, and low-growing barberry. Oriental lilies can last a week or two in a water-filled vase, or long enough to stay fresh in a bridal bouquet through a wedding and reception. Most florists cut off the pollen-coated anthers as shown here, since the pollen can stain anything it touches, including lily petals. But for outdoor bouquets, I leave the anthers atop those thread-thin filaments to enhance the drama. Cut the stems when one or two buds are starting to open, and the others are plump and coloring up. Oriental lily bulbs can live from three to five years or more in the same spot. When they get crowded, just dig and divide them.